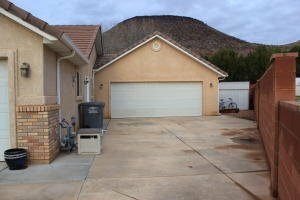 Located in popular Shadow Mountain, at the end of a cul-de-sac and next to a city park, this home will appeal to most everyone. Views of surrounding mountains and backs to the city park, allowing you to have almost 4.5 acres of backyard space you won’t have to maintain (the park has paved walking path and pond). The home offers 1763sqft, 4-bedroom, 2 baths, large open floor plan, spacious kitchen, detached workshop, pool, and a large yard with no neighbors on one side. I know I’ve caught the attention of many, by using the words “detached workshop”. There is an attached 2 car garage and a semi-detached larger 2 car garage/shop. The shop is independently heated and cooled and is very spacious, and it will comfortably accommodate 2 cars and still have room for other activities or storage. Equally as important…the POOL! This custom designed roman style saltwater pool features a raised waterfall with a lounging deck, a swim-shelf and it’s just off the huge patio making it perfect for large gatherings or entertaining. The pool has recent upgrades to the equipment, and the heater will extend the swim season to year-round if you'd like. There is a semi-private shower area and ample yard space for kids, dogs, or to simply enjoy. 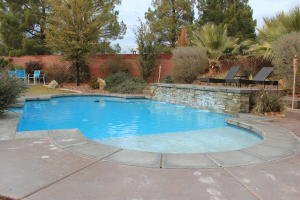 This lovely home backs to Shadow Mountain Park, which features a tree-covered walking path, pond, a large grass area for all activities, basketball court, volleyball, and a full playground. This is a backyard paradise that you won’t have to maintain, and you will enjoy year-round. The owners thought of everything, and there is a fuse box in the garage that can be used for a generator making the home have the ability to be run from a generator if desired (no generator will be included). There is so much to desire on the outside and surrounding, but the inside is just as excellent, having an updated look with modern and neutral color schemes. As you enter, there is a flex space room, use this for a library, formal living room, music room or enjoy a good book by the large window where you’ll have mountain views. One of the 4 bedrooms can easily be used as an office or den. The master is very spacious and offers a vaulted ceiling adding to the grand elegance and is complemented by the oversized (energy efficient) glass door that leads out to the backyard, bringing the outdoors inside and allowing the park like views to enjoy. There is a double vanity, large closet, and beautiful hardwood floors. The kitchen has been updated with stylish painted cabinets and it has ample counter space for food preparations. There is counter seating just off the dining area which also opens to the living area, making this a very large and usable great room, perfect for entertaining. Views out to the backyard with mature trees surrounding the yard, present a picture-perfect feeling with added privacy and shade for our warmer summer afternoons. 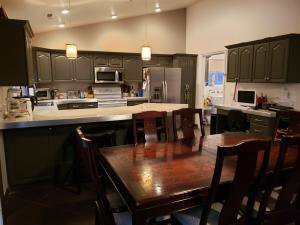 The laundry room is just off the kitchen, and there is a large walk-in pantry. This home is close to "Old Airport Hill" which has a popular walking/hiking trail. You’ll find BLM and off-road trails easily accessible in nearby areas. Don’t miss your opportunity to see this beautiful home, it will likely sell quickly, there is so much to desire about this area and the property, once you step inside, you’ll be pleasantly surprised. 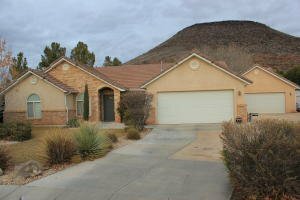 This home is listed by Paula Smith RealtyPath St George. I am Paula Smith, Associate Broker with RealtyPath of St George. I have been a licensed, full time, real estate agent in Southern Utah since 2006. If you'd like to see this home, contact me right away to set up a private showing. If you're ready to buy or sell, I'm prepared to make it happen.